Below I've included a couple of blog posts about KIA pro cee'd, written after the first and second year of ownership respectively, latest one first. 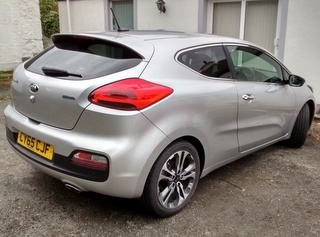 Two years on, how is my KIA pro ceed (pro_cee'd, pro ceed, Pro Ceed, whatever!) doing? A second year has passed, and the KIA is still going strong. Cut to the chase, I still like it, it's not been any bother (almost) and it still looks as good as new, inside and out. And we still haven't come with a name for it other then the KIA. It has now covered a modest 12,500 odd miles, pretty low I guess. It's done school runs (but not any more, now it's Uni runs) and toured around Dumfries and Galloway on holiday. Over all that distance it has returned 54mpg. Looking back over my previous article, little has changed in truth. In a nutshell, the car itself is perfectly fine, the software in the car is a bit dubious. Looking back you will see I criticised the sat-nav, the air-con, the stop-start and key-less entry system. None of them work all that well, but you get used to it - I mean they all work, it's just not that easy to get them to work somehow. If I was to be even more picky, during a recent visit to Pentraeth Automotive I was given a Picanto as a courtesy car. Not in the same league as the cee'd but I have to say the dash instruments were way better. The cee'd has a red display which isn't the clearest, the Picanto was white on black, much easier to read. Ah, yes, why was I at the garage? Well, I pointed out when the car was being serviced a few weeks ago that the alloy wheels appeared to be suffering from corrosion, a bit early on a two year old car I thought. To everyone involved's credit, I was duly offered a complete new set! I was amazed. Thank you KIA. Unfortunately (in a way) while swapping the wheels the mechanics spotted a bulge on one of my tyres, which required replacing, damn these pot-holes in all our roads, don't get me started. Returning to the car then, the only other gripe I have is that the Traffic Announcement system on the radio has been a bit flaky. I asked them to sort it at the service and to be honest I've not been off Anglesey since, so I'm not sure if they've fixed it or not. A nuisance but not fatal. So, looking at all the twaddle above I've done nothing but moan. So I should put that right - I actually DO like the car rather a lot and its solid build, 100% reliability and its frugality are commendable, long may it continue. And just one more thing to praise, it managed to accommodate three adults and a serious amount of clothing, computer equipment, guitars and general junk while transporting my lad off to Uni, in other words, it's actually bigger than it looks inside! 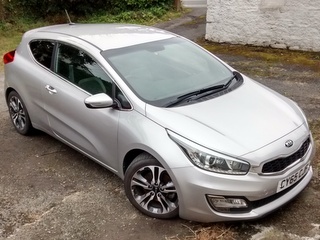 One year on, how is my KIA pro ceed (pro_cee'd, pro ceed, Pro Ceed, whatever!) doing? I've still not got used to that name, we never call it by its name, it's always just "the KIA". If we had two, I dunno what we'd do. I'm sat here in my local KIA dealer, waiting for the car to finish its first year service. It'd freezing and the rain is drumming on the windows. I'm hoping their promise of a 90 minute wait turns out to be true! (It was, under an hour and 15 mins actually, well done Pentraeth Automotive!) So, a verdict on the first year. I'd better 'fess up' right away, we've not exactly thrashed the car. It's only done about 6,000 miles. School runs in the main, and a couple of trips further afield, but nothing major. One day it will tour the Highlands, but not quite yet. Maybe 2017. One statistic I can reveal, the fuel consumption, which has been a predictably disappointing but not at all bad 54mpg. Comfortingly, this is what the car itself thinks it's doing too... I can verify this because sadly I have a fetish for recording such things. Reliability has been 100%, not even a glimmer of a fault. A very, very slightly leaky rear tyre, that's it. It is dripping with electrical gadgetry, all of it works perfectly, and the oily bits have performed without the slightest problem. Well... I say things work perfectly, they do but maybe there are some design 'issues'. For example, the keyless entry works, but you have to time your moves to perfection to achieve a smooth unlocking. You approach the car, the wing mirrors unfold, you press the door button JUST at the correct moment, you're in. But a second early or late, it takes umbrage and locks again. Now I just use the key fob. Oddly, the rear hatch works much better, approach the car with a shopping trolley in pouring rain and you'll find it's open, terrific. And the Stop/Start thingy. I just don't like it. I'll roll up to a T junction and be ready for a speedy turn onto the main road, to find the engine is off (I missed this cos I'm listening to Def Leppard). Okay, it starts quickly enough, but it's disconcerting. And the bad thing is, you can't just disable this feature, every trip you have to remember. Another niggle... probably connected with KIA's desire to keep your battery topped up so it can do the Stop/start... when you're sitting waiting in the car, engine off (which I often do) the radio/media player will go off after 5 minutes or so to save the battery. Bloomin' heck it's only a radio! This is annoying. And the sat-nav is a bit weird, sends you off on some odd routes, don't trust it. And the air-con, well, the climate control, can go a bit crazy sometimes if left to its own devices, maybe they all do, I'm sure it's trying and its heart is in the right place. And the only other thing to moan about would be... road noise. It does seem to make quite a racket on some surfaces. The handling is terrific and the ride is okay, but the roar from the tyres can get a bit tiresome. These niggles aside, it has been a pleasure to drive this last year. It looks good, is comfortable, goes fast well, goes slow well, isn't too big or too small, MPG is acceptable and the in-car gadgets are pretty good. I like it.